Quotes of major currency pairs continued its emergence in the past week as well. According to results of the week, USDX index lost 0,2% and the largest loss was received by US currency against British pound. Euro zone provided mixed statistics. Negative data on German labor market and retails were changed by moderately positive inflation and unemployment reports in Euro zone. Weak report on US consumer confidence CB showed the lowest values for the last 7 months and along with decline in durable goods orders figure supported demand in European currency. Eur/Usd closed trading week near to 36. Upon overcoming strong resistance level 1.6260, British currency accelerated its growth. Investors were encouraged by growth of consumer spending index, which is a crucial part of the economy, as well as by the comments of Bank of England Governor Mark Carney told about withdrawal of support package for mortgage lending as from January, 2014. He also stated that improvements in Euro zone are required to continue growth of the UK economy and internal demand solely is not able to ensure a serious recovery, when spoke in the Parliament's hearings. 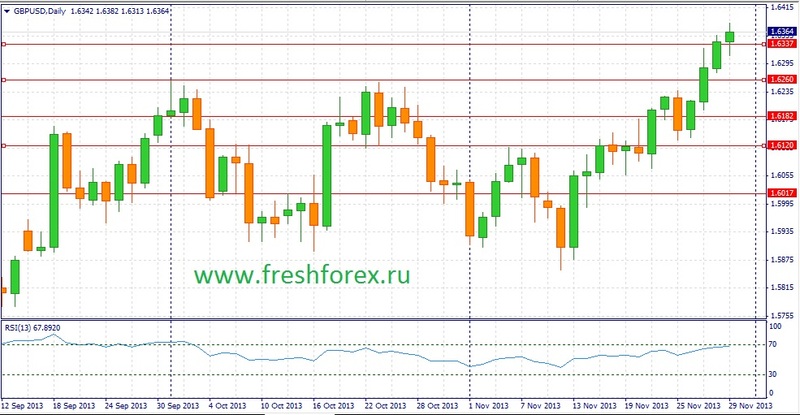 Nevertheless, British pound managed to establish a fresh high of 2013 at the point of 1.6382. Japanese news background was also mixed. Inflation remained on October level at the point of 1.1%, which is undoubtedly positive for Japan coping with inflation. However, the data on unemployment and industry output was negative. In general, Jpy/Usd shows a steadily ascending tendency and 5th trading week in succession is closed above the previous one. Current week is very interesting and eventful. On Monday and Wednesday all participants of Eur/Usd trades will receive report from the Institute for Supply Management with manufacture figures and the report on the US service sector. Data on the US labor market will be published on the last trading day of the week. It is worth mentioning that over the last time,positive news prevails over negative and releases can be just above expectations. FRS will carefully study Friday's report on labor market in the view of making decisions regarding future cut of the QE3 program. For European currency, core event of the week will be EuCB meeting scheduled for Thursday, 5th of December. In the end of the recent week, Consumer Price Index was released and showed growth in the rate of 0.2%. Now we can expect that European regulator will take a time-out in the task of cutting interest rates. 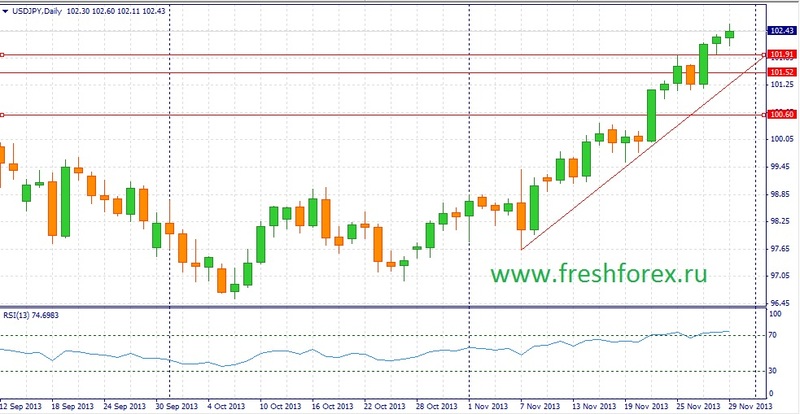 In the terms of technical analysis, breakthrough of a strong resistance level 1.3645 will open a path to 1.37. 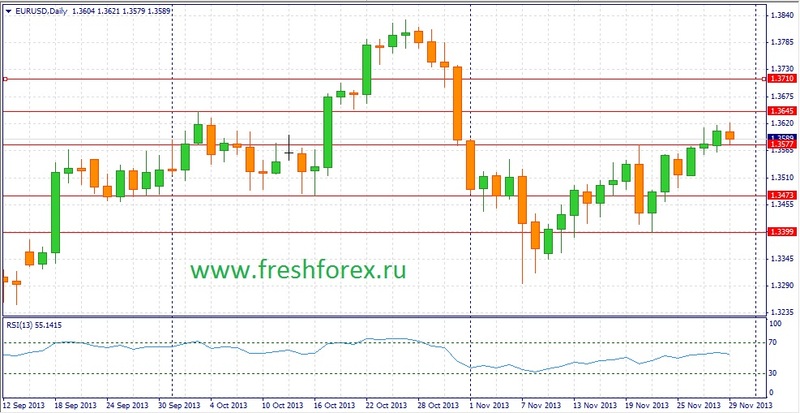 In general, a flat trend within the range of 1.3450-1.3700 can be expected for the European currency. Manufacturing, construction and service PMI will be released in Great Britain. Manufacturing and construction data can be reported on the medium level of forecasts. The recent weak data on estate price index from Rightmove can contribute to negative background for construction PMI and here we can expect that results will be below expectations. On Thursday, 5th of December, BoE meeting will take place, but one should not look forward for surprise information. The last week, Bank of England Governor Mark Carney provided detailed comments regarding British econony and one can expect that meeting of the regulator will take a usual forum. Now British currency shows a steady uptrend, but positive reports from the USA can make it correct to the point of 1.6180. Jpy/Usd took a stable emerging trend and this week such a trend can continue. No crucial economic statistics is expected from Japan. Entire attention of investors will be focused on the US releases and trade dynamics on the Japanese stock market. US can provide moderately positive data that will encourage bulls to open long positions. In the terms of technical analysis, Jpy/Usd currency pair and Nikkei 225 stock index has all chances to establish a fresh high of 2013 year.